Want to get away from it all without spending a month’s salary? We have just the place for you . . . the new Cottages of Indian River. 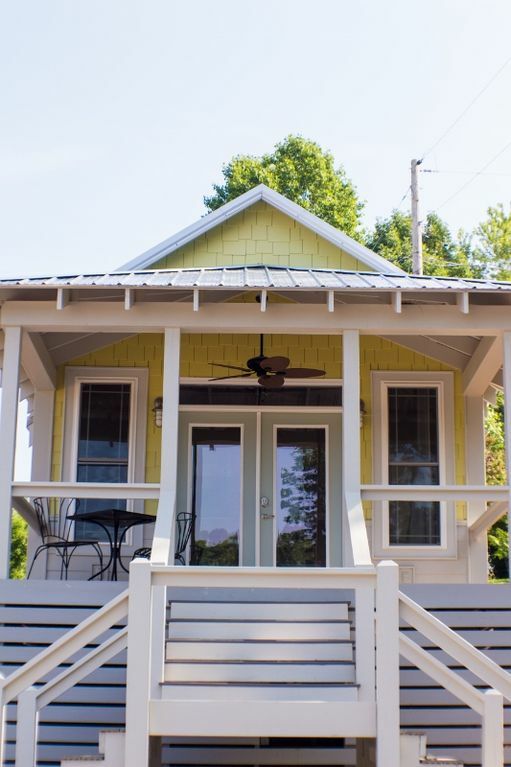 These cottages are located just across the street from Indian River Marina and offer everything you need for your lake home away from home . . . fully-stocked kitchens for the cook, satellite TV in the living room and bedroom for the entertainment buff, WiFi if you must check your email, and a slip for your boat. If you don’t want to trailer your boat or don’t own one, rent one from us so you enjoy all 800+ miles of shoreline that the lake has to offer. We have five total cottages. If this one isn't available, ask about the others! Debbie Samples has owned Indian River Marina since 1995. Debbie watches too much HGTV and has had the itch to flip a house. When she happened upon pictures of tiny houses, she thought, "That's really all you need on vacation . . . a nice place to sleep at night because you're out on the lake all day." So, with the help of a builder, her dream was fulfilled with the Cottages of Indian River. Brand new. Designer decorated. Rental includes boat slip. Two miles from town. The Cottages of Indian River sit just across the street from Indian River Marina. We enjoyed our stay on lovely Lake Norris!! The cottage was super cute, clean and new! We had everything we needed and then some. It was great to have the boat slip included and also great to know we could have rented a boat at the marina as well. Very nice! Highly recommend. Very nice place., everything was as said. Thank you We will be back.!! Do not miss this gem if you are looking to stay in the Jacksboro area. Conveniently located across from Indian River Marina and near several areas to ride ATVs. Very clean with a comfy bed. Nice amenities. Perfect for two. Any questions were quickly answered. Can’t say enough positive things. You will NOT be disappointed! It is a charming clean and fairly new property with a view of the marina and the lake. It is very convenient for boating. Boat slip and trailer parking was provided. Marina staff was very friendly and helpful. Debbie was very responsive to our questions. We had a great experience ! I would love to buy this cottage! The cottage is absolutely as advertised, clean, well built, decorated nicely and has everything needed for a great stay at the lake. Easy access to the lake, town and interstate. Nice clean and stocked with everything we needed. We spent a long weekend here. Checked in at marina first and got a boat slip, they told us we can leave boat trailer in cabin driveway otherwise you have to park trailer a few blocks away in their designated lot. Cabin was clean and well stocked. The only problem we had was bathroom window had no blinds so cabin next door could see in from their second story window. We would definitely rent it again and recommend to friends and family. As one of the most desirable vacation destinations in the southeast, Norris Lake has a long history beginning as early as 1911. During this year, the location for a future dam development in the upper Tennessee Valley had been discovered. The future development site named "Cove Creek Site" at the time was chosen due to its natural landscape and ability to host a large dam. On October 1, 1933, the relatively new Tennessee Valley Authority (TVA) took on their largest project and first dam, the construction of Norris Dam. The initial budget for the project was over $32 million dollars. Flooding had been a problem for the Tennessee valley for some time, and it was the goal for Norris Dam to bring some stability to the uncontrollable and unpredictable flooding as well as provide a substantial power source to the area. The name for the dam was an honor given to a long time supporter of TVA and Nebraska Senator George Norris (1861 - 1944). On March 4, 1936, Norris Dam was completed with the gates closed. The finished dam itself is 1,860 feet long and 265 feet high. By January of 1937, the Norris Reservoir was filled completely, creating the largest reservoir on a tributary of the Tennessee River. Norris Lake hosts 33,480 acres of water surface and approximately 809 miles of shoreline. TVA's finished project, the Norris Dam, also proudly delivers a maximum energy delivery of 131,400 kilowatts. The construction process of Norris Dam and the reservoir required massive purchases and acquisitions. Over 152,000 acres of land were purchased; 2,841 families and 5,226 graves were relocated to provide the construction area needed for the huge TVA project. The town of Norris, TN, was initially founded and built to house all of the thousands of workers involved in the construction of Norris Dam.